Your day-glow red-orange of choice?? I’m planning a project that’s going to need some pristine day-glow red-orange, and I’m curious what everyone’s current fave is. Someone somewhere mentioned that Krylon decanted and sprayed through the airbrush works well. should be applied over a white base and does not fade as a true neon color does. So is that actually fluorescent? I got a pleasing result eventually with Humbrol 209 Fluorescent Orange over a mostly white base, on my Heller EC-121 in the Navy Pacific Missile Range scheme, coincidentally to your earlier walkaround photos. Twenty five years later, it still needs some additional decals, but looks impressive enough as it stands. I say eventually, because I had real clogging problems using my regular auto store lacquer thinners. A call to Humbrol technical services made me aware that all thinners of the same type are not necessarily of the same grade. Using Humbrol's own brand lacquer (cellulose in the UK) thinners worked well and sprayed flawlessly. Mostly white base is because in areas where I wanted fading, I applied Humbrol Saturn Yellow as an undercoat, but that doesn't seem to be available any longer. In any event, it wasn't really needed as just applying the orange more lightly over the white base produced a nice enough to-scale faded effect where required. Oops for the P-51 in the background. I just snapped a quick pic of the paint. Unfortunately on this side of the ditch, Humbrol isn't an option. Sprue Brothers sells a ton of Humbrol products, both acrylics and enamels. Do you mean "Fluorescent red" like what you see on this car? Folks who are into making McLaren F1 cars or anything with that iconic Marlboro sponsorship from over the years love Mr. Color 171 "Fluorescent red". It's what I have used with good results myself. One key is that it does not lose its fluorescence over time as some others do, including Tamiya's TS spray equivalent. 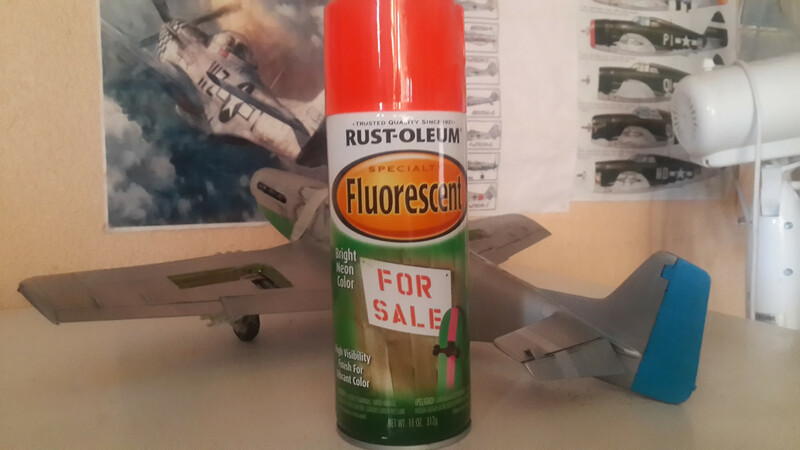 I advise against using any Rustoleum product as that is not a true lacquer and it literally never cures.